SilverStone presents its new Storage Solution SST-MS04, this is a versatile 3.5” hard drive enclosure with excellent thermal and functional properties. 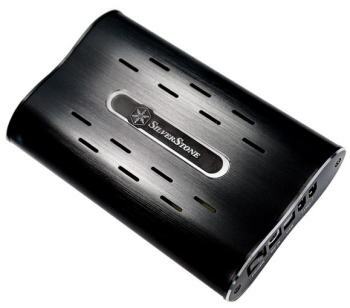 It has both USB 2.0 (backwards compatible with USB 1.0) and Firewire (IEEE1394) connections for wide range of applications. With its unique two Firewire ports, it is possible to daisy-chain the MS04 for more storage options or simply to retain a free Firewire port in the system. Built from exquisitely crafted all aluminum and finely brushed, the MS04 has a finish that matches the best hi-fi components in the world. Its enclosure is not only beautiful, but also designed to accommodate hi-end IDE drives with abundant cooling. To complete the package, a vertical stand is also included to create a mobile storage solution that is both practical to place anywhere and stylish! It's available in Europe for 62EUR (without VAT).